My friend, Sarah....from Idaho, made this gorgeous quilt, "Delilah", by Jen Kingwell. You can find the pattern here at Amazon. and beautiful this quilt is. I'm such a fan of anything by designer, Jen Kingwell. I have several of her patterns, books and fabrics. Sarah used at least a gazillion different fabrics in her quilt. It was a block of the month program sent all the way from Australia, fabrics and templates included. What fun to receive fabrics from overseas! Here are some close ups of "Delilah" after I quilted it. Sarah did such a great job with color placement. This is one of my favorite blocks - tiny little orange peel shapes within the star. There are lots of curvy pieces - love it! A close up of at least one of each block within the quilt. It doesn't get much prettier than this! Sarah - you have some serious ninja quilting skills! Thank you for trusting me with such a beauty......I loved every single minute of quilting it for you. It's a stunning work of art, that's for sure! Thanks, Helen. Beautiful! I'd love to sit for hours looking at all the different fabrics! Lucky me - I got to do that while I quilted it.....every single inch! Thank you, Gail - it's a beauty for sure! Wow, what a project! It turned out beautifully, and your quilting is perfect for how busy the quilt is. Fun on to work on. It was such fun to quilt - I didn't want to send it home! Thank you, Kathy! 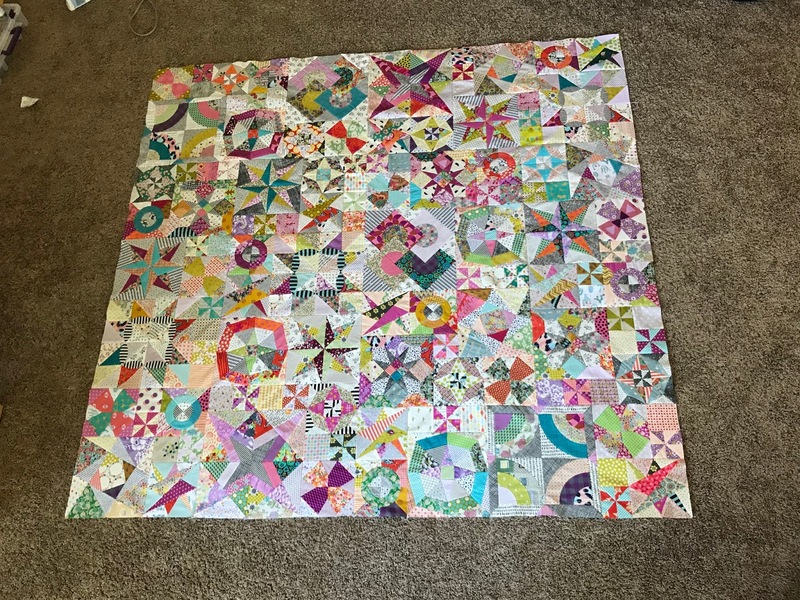 You did the most amazing job quilting it! I love it. It is bound and soaking up the sun in my office. Thank you so much! Well, your office is a very lucky place if that's where it's staying. I loved quilting it - your work is near perfection, my friend.